BBC iPlayer is an internet streaming, catchup, television and radio service from the BBC. The service is available on a wide range of devices, including mobile phones and tablets, personal computers, and smart televisions. iPlayer services delivered to UK based viewers feature no commercial advertising. The terms BBC iPlayer, iPlayer, and BBC Media Player refer to various methods for viewing or listening to the same content. Viewing live television broadcasts from any UK broadcaster, or BBC TV catch-up or BBC TV on demand programmes, in the UK without a TV licence is a criminal offence. In 2015, the BBC reported that it was moving towards playing audio and video content via open HTML5 standards in web browsers rather than via Flash or their Media Player mobile app. On 17 October 2018, the BBC 'iPlayer Radio' brand was renamed BBC Sounds. BBC Redux was developed as a proof of concept for a cross-platform, Flash Video-based streaming system. :15 BBC iPlayer left beta and went live on 25 December 2007. On 25 June 2008, a new-look iPlayer was launched, originally as a beta-test version alongside the earlier version. The site tagline was "Catch up on the last 7 days of BBC TV & Radio", reflecting that programmes were unavailable on iPlayer after this time (with some exceptions). The BBC state on their website that this is due to copyright reasons. The marketing slogan was later changed to "Making the unmissable, unmissable". In May 2010 the site was updated again, to include a recommendations feature and a "social makeover". In February 2011, the BBC iPlayer was once again modified to include links to programmes from other broadcasters, including ITV, ITV2, ITV3, ITV4, Channel 4, E4, More4, Film4, Channel 5, 5Star, 5USA and S4C. The feature was added to the search function and the channels function. When users click on a programme by another broadcaster, they are redirected to the relevant broadcaster's catch up service (either the ITV Hub, All 4 or My5). In April 2014, BBC iPlayer was once again relaunched with a new look and a different user interface. From October 2014, the BBC extended the programme availability for programmes on iPlayer from 7 days to 30 days. However, due to legal reasons, most news bulletins are only available for 24 hours after initial broadcast (with the exception of World Business Report, Business Live, Victoria Derbyshire, Daily Politics, Politics Europe, Sunday Politics and Newsnight) . Some archive programming is available for the long term, such as Timewatch. Specific applications for mobile platforms were launched in February 2011. These were initially for iOS and Android devices, where the launch would have the biggest impact. The original iPlayer service was launched in October 2005, undergoing a five-month trial by five thousand broadband users until 28 February 2006. iPlayer was heavily criticised for delay in its launch, rebranding, and cost to BBC licence-fee payers, because no finished product had been released after four years of development. A new, improved iPlayer service then had another very limited user trial which began on 15 November 2006. At various times during its development, iPlayer was known as the Integrated Media Player (iMP), Interactive Media Player, and MyBBCPlayer. The iPlayer received the approval of the BBC Trust on 30 April 2007, and an open beta for Windows XP and Windows Server 2003 was launched at midnight on 27 July 2007, where it was announced that only a fixed number of people would be able to sign up for the service, with a controlled increase in users over the summer. The BBC had been criticised for saying that the iPlayer would 'launch' on 27 July 2007, when what was on offer was simply an extension of the beta to an open beta, admitting more users in a controlled manner. This was done reportedly to allow British ISPs and the BBC to gauge the effect of the iPlayer traffic on the Internet within the UK. The open beta incorporated a media player, an electronic programme guide (EPG) and specially designed download client, and allowed the download of BBC Television content by computers assigned to a United Kingdom-based IP address, for use up to thirty days after broadcast. However, it was available only to users of Windows XP. ... the Trust noted the strong public demand for the service to be available on a variety of operating systems. The BBC Trust made it a condition of approval for the BBC's on-demand services that the iPlayer is available to users of a range of operating systems, and has given a commitment that it will ensure that the BBC meets this demand as soon as possible. They will measure the BBC's progress on this every six months and publish the findings. On 16 October 2007, the BBC announced a strategic relationship with Adobe, that would bring a limited, streaming-only version of the iPlayer to Mac and Linux users, and Windows users who cannot or do not wish to use the iPlayer download service, such as Windows 9x users. The streaming service was launched on 13 December 2007. Most programmes can be viewed for up to seven days after broadcast, unlike the thirty days provided by the download service. Since January 2008, iPlayer has supported Mozilla Firefox under the Microsoft Windows platform for downloading content. Before the iPlayer had even launched, it was announced that the BBC, alongside ITV and Channel 4, were intending to launch a new video on demand platform, provisionally named Kangaroo. It was intended that Kangaroo would complement the video on demand services that these channels were already offering, including the iPlayer, by making programmes available once their "catch up" period expires. The Kangaroo project was eventually abandoned after being blocked by the Competition Commission early in 2009. Following a deal between the BBC and cable television provider Virgin Media, the iPlayer service was made available through the provider's on-demand service. The cable service launched on 30 April 2008, and keeps the look and feel of the BBC iPlayer program. In response to a Freedom of Information Act request, the BBC revealed that as of 8 April 2008 the iPlayer had so far cost £6 million to develop. On 23 August 2008, a new feature, Series Stacking, was announced. This feature started being rolled out on 13 September 2008, and allowed viewers to watch previous programmes from selected series until the series has ended, with a limit of up to thirteen weeks after first broadcast. Not all programmes will form part of the stack, however. The BBC Trust permitted 15% of content to be offered as part of the stacking service; soaps, news bulletins and review-based programmes will not be stacked, nor programmes containing material of a legal nature, such as Crimewatch. On 19 December 2008, the BBC released, as part of the iPlayer Labs feature, iPlayer Desktop for OS X and Linux operating systems. This moved the download service away from the previous P2P based distribution model and onto an HTTP download model. On 20 April 2009, the BBC incorporated high-definition streams and downloads of some content on the iPlayer. There are plans to roll out the HD streams to devices such as the Virgin Set Top Box, but no date has yet been set. An iPlayer application for the PlayStation 3 was announced by Sony in August 2009 and was released on 1 September 2009 along with the Firmware 3.0 update to coincide with the launch of the slimline PlayStation 3. Another version of iPlayer was released in late 2009 as a 'channel' for the Nintendo Wii. This shows only low definition videos of BBC shows up to seven days after their release on television. On 28 July 2011, BBC Worldwide released an international version of the iPlayer. Speaking in 2012, Ralph Rivera, BBC Director of Future Media, said that "In the same way as the BBC has a role in making sure there is a healthy TV ecosystem, the BBC should be playing the same sort of role in the digital sector. It's part of why we have a licence fee." BBC Radio services delivered via iPlayer were relaunched on 8 October 2012 under the BBC iPlayer Radio brand. The rebranded service offered different functionality to the main iPlayer interface and a BBC iPlayer Radio smartphone app was also launched. On 26 September 2013 BBC iPlayer Desktop was replaced by BBC iPlayer Downloads, which was no longer based on Adobe AIR. On the same date the BBC stopped making programmes available to download in WMV format. The BBC discontinued the RSS feed for iPlayer TV content in October 2014. This stopped some third-party tools such as the get_iplayer content downloader from working. In March 2016 an unofficial site restored access to this information. In September 2015 it was revealed that as part of Tony Hall's "open BBC" strategy, coming primarily in response to budget cuts across the BBC that will require it to discontinue or factor some of its services, the BBC planned to offer third-party content through iPlayer in the future, as well as launch a spin-off, iPlay, which would be tailored towards children's content. In September 2016, support for older Freeview and Freesat receivers manufactured between 2010 and 2014 was dropped. On 30 October 2018, the BBC relaunched its iPlayer Radio services as BBC Sounds, including a newly-designed website and mobile apps. Prior to September 2016, a television licence was not required to stream either BBC television or radio programmes from iPlayer which had already been broadcast, though a licence was still required in order to watch live content. Since 1 September 2016, a television licence is required to view any iPlayer content, regardless of whether it is live or on-demand. Despite the requirement, the enforcement of this measure only uses a trust system, under which users must acknowledge a pop-up window warning of the new requirements. Neither the BBC, or TV Licensing, announced any specific plans to implement detection measures. In September 2016, the BBC also announced that users would eventually be required to sign in with a BBC ID account to access non-children's content on the service. In May 2017, iPlayer began to encourage users to login with a BBC ID in preparation for this change. Media outlets suggested that the account requirement was intended to help the BBC collect personal information that could be used to trace those who are evading TV Licensing whilst using iPlayer; Andrew Scott, launch director of the ongoing myBBC initiative, stated that the BBC may use account email addresses, along with existing methods, to help identify iPlayer users who do not hold a television licence. However, he repeatedly said that the account system was primarily intended to provide personalization features across BBC properties, such as content recommendations on iPlayer, and the ability to continue watching a programme on one device from where it was left off on another. One of the key features of the original iPlayer download service was the use of peer-to-peer (P2P) technology to enable the distribution of large video files (i.e. TV programmes) to scale effectively. Once downloaded, the content was only playable within the iPlayer itself or Windows Media Player 10 or 11, and subject to digital rights management. In December 2008 the BBC moved to an Adobe AIR-based client that downloaded content via HTTP rather than P2P. The new system replaced the Windows DRM system with Adobe's own. DRM software prevents it being directly copied to another medium (e.g. another computer or CD-ROM), and allowed the BBC to control how long the programmes remain watchable. Programmes were available for download for seven days following broadcast. Once a programme is downloaded a user had thirty days to start watching it; after starting to watch, a programme remained available for the next seven days. Using the online streaming service most programmes became unavailable from the website after 7 days. There was criticism levelled at the iPlayer's use of KService from Kontiki, the peer-to-peer application which continued to use users' bandwidth even after the iPlayer had been shut down. Because of this, users may have been charged by their Internet service provider for exceeding their download limit or breaching the so-called "fair use" policy. However, the Kontiki P2P system was not used after the new client was introduced in December 2008. The client offered an electronic programme guide (EPG) with listings for both the previous seven and next seven days' programmes; selecting a programme which had already been broadcast began downloading it immediately, while those not yet shown would be downloaded when available. It was not possible to schedule a series to be automatically downloaded when the next episode becomes available. The BBC's streaming version of iPlayer, using Adobe Flash software, was launched on 13 December 2007. The BBC made use of the Christmas period to trumpet the new service with the tagline 'Making the unmissable... unmissable', and the service came out of beta on 25 December 2007. Also, seasonal specials were followed routinely throughout the Christmas week with plugs for iPlayer. The streaming version of iPlayer offered replays of programmes broadcast on all national BBC TV channels and S4C during the last seven days. Due to licensing agreements, all international and some privately produced TV shows and movies are not available on iPlayer. 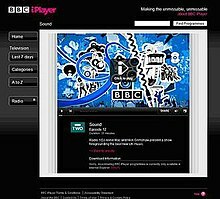 On 25 June 2008, the BBC announced that they had been developing a new version of the iPlayer based on user feedback – it was then called "BBC iPlayer 2.0". New features included combining the normal television iPlayer with the radio iPlayer, schedules of programmes due to be on the iPlayer, automatic resumption of the last programme watched, an increase in the size of the screen by 25% to 640 pixels wide, RSS feeds of iPlayer data, and a "Yesterday's TV" function. The beta ran alongside the existing site until 3 July 2008, when a new version replaced it. Later versions have implemented an option of streaming videos in high quality in H.264. A special version of BBC iPlayer was launched 19 December 2008. It was designed for children aged 6 to 12, allowing them to choose from series such as Blue Peter, M.I. High, The Sarah Jane Adventures and more (non-children's programming is restricted). At the end of 2008, a newer platform was launched which facilitated use of the new BBC iPlayer Desktop (replacement for Download Manager) and other "BBC iPlayer Labs" features such as adjustable video windows and user feedback options. In March 2009, the BBC launched a streaming version of the player which needs a 1500 kbit/s minimum connection. On 1 April 2010, this Desktop Manager was updated to version 1.5.15695.18135. The update claimed, amongst other things, optimisation of CPU usage in full screen: 20% to 40% improvement; videos that start to download in the UK should be able to complete downloading abroad; and update to use Adobe Integrated Runtime AIR 1.5.3 which has improved reliability, compatibility and security. The iPlayer team released the next-generation of the iPlayer, calling it the iPlayer 3.0 release, on 6 September 2010. It brings integration with various social networking sites to the TV on-demand service, through deals with Facebook, Twitter, Reddit, Delicious, Digg and StumbleUpon. BBC ID was also added to allow users to access their iPlayer settings from a variety of devices and Favourite shows so the users get notified when new episodes of their favourited shows are available. The only other feature of the new-look iPlayer discussed was a new embeddable video player, being rolled out across the whole of the BBC's online presence. On 19 June 2012 on the live TV channels it added a rewind to start button. The BBC reported iPlayer users had technical problems with the release of Adobe AIR 3.5, and another with Google Chrome. The iPlayer Desktop application was replaced with the simpler iPlayer Downloads application, from which some features were dropped, for example live streaming. On 11 March 2014, the BBC introduced a new version of their BBC iPlayer service called 'The New BBC iPlayer'. This new version included a new user interface, and uses the BBC's new 'responsive design,' which means iPlayer can be used on multiple different screen sizes without building separate versions. There is a new home screen along with new channel pages that also use the same responsive design that the rest of the BBC sites now use. 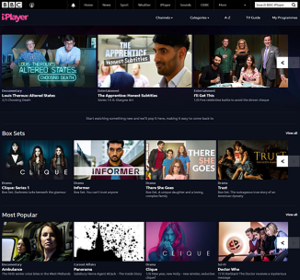 The BBC ID is still used to track favourites across the site (however favourites have now been moved to a whole page rather than an individual bar), and new categories have been generated to expand the amount of programmes that can be found by the 42% of visitors who arrive to the iPlayer service without a particular programme in mind. The new pop-out radio player has removed the option to select either high or low bit-rate which may impact users with a data download cap. It no longer restores the volume level or play point from the previous session. BBC iPlayer introduced an Ultra HD trial allowing users with an Ultra HD device to watch with greater picture detail. From December 2016 to January 2017 this was being used to show a 4-minute clip of Planet Earth II in 4K. In early 2016, regional opt-outs for 15 English regions were introduced so regional programming could be watched live. In the second half of 2010, 3view enabled HD iPlayer on its connected Digital Terrestrial TV boxes allowing owners to access iPlayer content in HD via the box. On 27 May 2008, BT began to charge BT Vision customers £3 per month for watching BBC Replay, a cut down version of iPlayer offering a more limited 30 hours of BBC programming per week. A spokesman for BT said that its customers had previously been able to view only BBC on-demand content because of "technical issues". A BBC spokesman said: "In line with other TV platforms where BBC programmes are made available on demand, the BBC requires that all public service content should be accessible via the lowest cost subscription tier. In this case, it is BT Replay." From 1 April 2009, the Replay package was included in all of BT Vision's Value Packs but remained available as a separate, £2.93 per month, package to non-subscribers. On 11 November 2010, the BBC and BT announced plans to bring the full BBC iPlayer package to BT Vision, replacing the BBC content on BT Vision's 50-hour "TV Replay" package. BT introduced BBC iPlayer in a phased release, starting in early December 2010, with all BT Vision customers able to access the service on channel 990 by 22 June 2011. BBC iPlayer downloaded TV programmes can be streamed to televisions via the NetGear EVA8000 and Linksys DMA2200 digital media receivers, through PCs running Windows XP or Vista, with Windows Media Center installed. On 23 July 2009 the first subscription-free digital terrestrial device to include iPlayer went on sale in UK retailers. The FetchTV Smartbox connects to any broadband connection and gives access to the BBC iPlayer and is a Freeview+ PVR. FetchTV created its own version of the iPlayer, believing it was adhering to BBC guidelines, but support was refused by BBC Future Media and Technology. IP Vision made a formal complaint to the BBC in March 2009: the matter then passed to the BBC Executive's Fair Trading Complaints Panel, which rejected the complaint, and IP Vision then appealed to the BBC Trust. On 22 December 2009 the BBC Trust rejected FetchTV's request to release the product. The Trust's Finance and Compliance Committee (FCC) found that the BBC had given reasonable arguments as to why IP Vision should not be allowed to go ahead with its self-build product. The Trust FCC also rescinded new guidelines introduced by the BBC in October 2009 formalising a ban on third parties building their own commercial iPlayer products . The Trust concluded that the clarification amounted to a significant change to the syndication guidelines which should have been referred to the Trust for approval before publication. On 2 November 2009, it was announced that a beta release of BBC iPlayer for Freesat would be released on 7 December 2009 to a limited number of Freesat viewers. On 21 December 2009, iPlayer was made available on a soft launch to Freesat viewers with Humax Foxsat HD receivers only, with an official release on 11 January 2010. It is the final beta version of iPlayer, available via the red button on interactive page 7001. On 20 January 2010, Sony released software update 1.630SA to enable BBC iPlayer on all of their Freesat integrated televisions. On 25 March 2010, iPlayer was added to TechniSat receivers, with an update for Harvard International receivers released on 31 March. However, the Harvard upgrade will not be available on early model standard definition Freesat receivers sold under the Bush, Goodmans and Grundig brands. Harvard International is therefore offering a replacement high definition receiver to anyone affected. Panasonic had aimed to add iPlayer to all of its devices by October 2010, but support was only extended to the 2008 range in September 2011. LG have been unable to update their Freesat integrated LF7700 television and were offering a free Freesat set-top box, however this promotional goodwill gesture ended after a 6-month period. On 16 December 2010, BBC iPlayer was assigned to Freesat channel 901, in addition to access via the BBC Red Button. On 4 May 2009, the managing director of Freeview, Ilse Howling, announced expectations that iPlayer-enabled Freeview boxes would be available in 2009. From 1 April 2011, all new Freeview HD receiver products must include MHEG Interaction Channel (MHEG-IC) as part of D-Book 6.2.1. The move allowed the standard MHEG-5 reliant iPlayer application to be offered from 7 April via the red button on all BBC channels to Freeview HD certified devices. On 10 February 2012, Roku launched their streaming devices in the UK for the first time, with BBC iPlayer available from launch. On 26 July 2013, Now TV released a Now TV-branded Roku streaming box, including the BBC iPlayer app. On 30 January 2012, it was announced that BBC iPlayer would be added to Sky's On Demand service, arriving on 30 October 2012. The launch reduced the amount paid by the BBC for its carriage on Sky by up to 30%, following the introduction of a clause in BSkyB's Published Price List which reduces the amount paid by a public service broadcaster when one of its channels offers on demand programming to Sky receivers. BBC iPlayer via Sky requires a subscription to Sky TV channels or to Sky+ and a Sky+ HD box with an internet connection. In December 2009, Cello Electronics released the Marks & Spencer branded iViewer TV. The television is internet enabled, allowing for the viewing of online content including the BBC iPlayer, which has its own physical button on the remote, although BBC iPlayer HD wasn't available until 2010. On 11 January 2010, the BBC announced that BBC iPlayer would be built directly into TVs that would be widely available in the UK within months. Samsung Electronics became the first major manufacturer to officially announce that its televisions would be updated to include full access to the iPlayer. A BBC iPlayer app is available to download from Samsung Apps for Samsung Smart TV. Sony added BBC iPlayer to its BRAVIA Internet Video service, included in its 2010 range of televisions and Blu-ray players. On 9 September 2010, iPlayer was added to Sony's BRAVIA televisions, having previously only been available on Blu-ray players. Televisions needed a firmware update which could be upgraded over the internet or downloaded onto a USB flash drive for loading directly to the TV. At the time of launch BBC HD content is not available, though high and standard video quality are available on all programmes. On 30 April 2008 the iPlayer service was fed directly to Virgin Media's 3.4m digital cable TV customers as part of the company's video-on-demand service. Pressing the 'red button' while watching a BBC channel on TV will bring up the iPlayer service without the user having to access the web. On 29 May 2008 Virgin Media successfully integrated iPlayer with the Virgin Media electronic programme guide. Most BBC shows are now listed alongside other VOD content in Virgin's Catch Up TV section, and through the red button while viewing a BBC channel. There is no charge for watching BBC shows through the iPlayer on Virgin Media. As of 21 July 2008, iPlayer on Virgin Media had received 10.5 million views since its official launch on 1 June 2008. On 26 September 2008 it was revealed that one third of all iPlayer programme views were accessed through Virgin Media. On 1 May 2009, the BBC and Virgin Media announced the launch of HD content via BBC iPlayer on Virgin Media's TV platform, including Robin Hood, Friday Night with Jonathan Ross and Later... with Jools Holland. On 2 March 2011, Virgin released an iPlayer application for their TiVo digital video recorder. Unlike the previous implementation, the application streams over the internet rather than utilising Virgin's video-on-demand service, to comply with the BBC's then proposed syndication policy. The change also allows an increase in the amount of programmes available, from around 300 to 700 hours on average, bringing Virgin into line with the iPlayer on connected TV devices. At the same time, Virgin Media were also forced to remove direct access to BBC content on TiVo, meaning that instead of being able to access BBC content through its EPG, Virgin TiVo users instead had to go through the Apps and Games area or press the Red Button from a BBC channel. This access was reimplemented with the release of TiVo update 15.2 in late 2011, which integrated BBC iPlayer once again into the TiVo search and EPG after new guidelines on syndicated content were published by the BBC Trust. BBC iPlayer was one of four services available at the launch of YouView in July 2012. At launch the BBC iPlayer app contained options to resume watching recent programmes, access favourites, browse the most popular shows, find similar programmes or more episodes, included integrated search and was the only service to feature HD video. In September 2009, the PS3 iPlayer was updated with H.264 playback and full screen content. Future plans for the PS3 iPlayer include features from iPlayer V3 scheduled for late 2010. On 8 August 2011, the application was updated and now includes access to BBC HD, however most content remains unavailable to PS3 users due to DRM restrictions. In October 2013, Sony confirmed that the PlayStation 4 would have the BBC iPlayer app. Additionally, they announced that BBC iPlayer would continue to be free to access and would not be part of the PlayStation Plus subscription service. On 9 April 2008, the BBC iPlayer was made available to stream video content on the Wii video game console via the Internet Channel. This was enabled by a recoding of the iPlayer to use Flash 7 rather than Flash 9. However, the Autumn 2009 update to the Wii's Internet Channel resulted in the iPlayer's no longer working on updated consoles. A BBC iPlayer in the form of a dedicated Wii channel was launched on 18 November 2009. The BBC iPlayer Channel is free to download from the Wii Shop Channel; on 10 February 2015 the BBC announced on their website that they had removed BBC iPlayer from the Wii Shop Channel and terminated the service on the Wii. The BBC cited their policies in resource management as the reason. BBC confirmed  that this application was set to be released on Nintendo's Wii U at launch, but due to some issue, it was delayed. On January 2014, BBC stated that this application is set to appear soon on Wii U. On 11 December 2014, Senior product manager Peter Lasko of BBC stated that they hope this application will come to Wii U in early 2015. Without prior notice, however, the app was eventually released for the Nintendo eShop on the Wii U by 28 May 2015. On 31 August 2016, only about 15 months after launch, the BBC iPlayer was de-listed from the Nintendo eShop, and the BBC later confirmed terminating the service by 16 January 2017 for those who already downloaded the app on the Wii U. The BBC cited the end in the licence agreement between them and Nintendo UK as the reason. The BBC and Microsoft had been unable to reach a deal to add the iPlayer to the Xbox 360 for a number of years, because Microsoft's strategy of charging for all content on its Xbox Live platform is incompatible with the BBC's public service remit. Microsoft wanted to ensure that only those paying for Xbox Live Gold accounts could access its added content services. The BBC is not legally allowed to charge the UK public for access to the iPlayer, as the access charges for it are included in the BBC licence fee already. In October 2011, it was announced that the BBC content would be made available to all Xbox Live members in the UK, including Xbox Live Free members. On 20 March 2012, BBC iPlayer became available on Xbox Live; the service includes Kinect functionality. The BBC announced that support for iPlayer on Xbox 360 is to be terminated on 27th March 2019. In October 2013, Microsoft confirmed that the Xbox One would have the BBC iPlayer app. However, despite Microsoft's claim that the BBC iPlayer app would be available for Xbox One from launch day in the UK, it was not. The BBC commented in December 2013, saying: "BBC iPlayer is already available to audiences on over 1,000 devices and platforms in the UK. Whilst we are working to bring BBC iPlayer to Xbox One in the future, we have no further details to share at this time." In January 2014, a report by a BBC programmer announced that an issue with the Kinect sensor had caused the app's delay. He added that all Xbox One apps have to offer gesture and voice controls, as well as Snap features and media achievements. In August 2014, the BBC reported on its blog that they were aiming to release BBC iPlayer on Xbox One by the end of 2014. On 4 December 2014 BBC iPlayer was released. On 23 June 2010, after many months of complaints from Android users, BBC iPlayer officially announced support for the Android platform. Users can navigate to the usual BBC iPlayer website, and a mobile website is displayed. As a result of the BBC's decision to use Adobe Flash Player to handle video playback for Android devices on this website, users must be using Android 2.2 or later (the earliest Android version supported by Flash Player). On 8 February 2011 the BBC announced that Android, alongside the iPad, would be amongst the first two platforms to receive a native iPlayer application. The application was made available via the Android Market to UK users, but as with the earlier mobile website, the application uses Adobe's Flash Player for video playback and as a result is only available for devices running Android 2.2 to 4.0 since Android 4.1 does not support Flash Player. On 4 September 2012 the BBC posted on their internet blog that Android users would soon be able to download programs using the BBC iPlayer app. On 19 September 2012 the BBC reported that an Adobe AIR based iPlayer application had been developed for Android 4.1, as well as earlier versions. The application, named BBC Media Player, is intended to permit continued iPlayer support for the Android platform. On 5 November 2010, an official BBC iPlayer app that allows users to stream live television and radio, and catch-up on previously aired content became available for download on BlackBerry OS 5.0 (and higher) devices. A Wi-Fi connection is needed for an "optimal viewing experience" but 3 and Vodafone are allowing it run on their 3G networks. On 7 March 2008, a beta version for Apple's iOS devices (iPhone, iPod Touch, and later iPad) was released, allowing streaming over a Wi-Fi connection. An update released on 12 December 2011 allowed streaming over 3G. On 4 September 2012, an update provided the ability to download programmes for up to 30 days, with a seven-day viewing window. The EDGE connectivity on the iPhone, however, is not supported, as it is too slow for streaming video. Non-iPhone users were found to be watching and downloading streams intended for iPhone users allowing them to play them on alternative devices. The BBC modified the iPlayer service on 13 March 2008 to prevent this. Through the month of June 2008 further methods were discovered by iPlayer users to watch and download streams intended for iPhones. A Ruby hole was followed by the BBC introducing XOR encryption on parts of the downloaded files if a genuine iPhone was not detected. The BBC introduced specially crafted web bugs, referrer checks and download chunk limits, such that only devices exhibiting this behaviour, i.e. a genuine iPhone handset, would be able to stream the video content. A cycle of updates and reverse engineering has followed such that all the various streams, both for the iPhone and Flash streaming service, are now able to be downloaded without the need for decryption or DRM circumvention. This has been made possible by various software which can effectively simulate a RTMP Flash client or an iPhone. In early December 2010, the iPhone MP3 access was being changed to use HTTPS. The server checks the client's certificate and only accepts connections for those issued to Apple. This change to the protocol not only prevents access to non-Apple devices but also disables use by a number of early generation iPod Touch devices. On 28 July 2011, BBC Worldwide released an international version of the iPlayer for the iPad. A UK version of the iPlayer for iPad app was also launched, however, this version only allowed streaming video and did not allow any offline viewing. In December 2011 the iPlayer app was extended to work with the iPhone and iPod Touch. On 18 September 2008, the BBC announced that a version will become available to the Nokia N96 mobile phone as a download service to allow viewers to watch programmes even when they are out of reach of Wi-Fi or 3G networks. The launch date was set of 1 October 2008. Shortly after on 9 September 2008, even before the BBC Nokia N96 download service had gone live, a method was published to independently download and play the iPlayer N96 3GP stream on other mobiles, Linux and Mac OS. BBC Released BBC iPlayer app on Windows Phone 8 devices on 15 May 2013 as a mobile wrapper UI. Available on the Windows Phone Store. In early December 2008, iPlayer was updated to include streaming radio and television, and extended to a variety of handsets including Nokia 5800 XpressMusic, Nokia N8, Samsung Omnia, Sony Ericsson C905, Sony Ericsson XPERIA X1, and Sony Ericsson W995. BBC Store codenamed Project Barcelona launched in the UK and opened the archive to consumers and allowed users to buy a show and download it. BBC Store was approved by the BBC Trust in 2014 and the store launched in 2015. It was initially hosted on a dedicated website but later integrated with BBC iPlayer. BBC Store closed in 2017. Before the launch in December 2007, the BBC had hoped the service would reach half a million users in its first six months. This turned out to be a gross underestimate, as 3.5 million programmes were streamed or downloaded in the first three weeks alone. The Guardian described these figures as "remarkably promising". In its first year, 2008, growth continued at an impressive rate. By April, the iPlayer accounted for around five percent of all UK Internet traffic, and had approximately five million page views per day by June. In December, it was announced that more than 180 million programmes have been watched on iPlayer since its release. During the BAFTAs in May, the iPlayer won the "Interactive Innovation Service/Platform" Award, beating Channel 4's 'Big Art Mob' and the Bebo 'Open Media Platform'. The streaming of programmes forms the lion's share of the success, outnumbering downloads eight to one in January 2008, and 97:3 in October 2009. In the month of October 2009, it was revealed that the site experienced 70 million requests and transferred seven petabytes of data. Television formed about two thirds of all requests, with radio making up the rest. Most TV was streamed from pre-recorded footage, whereas live streaming was preferred of radio. Eighty-five percent of requests were from computers, with much of the rest coming from iPods, iPhones and PS3s (from a total of 15 platforms). The most popular TV programme of 2009 was Top Gear, and the most popular radio was that reporting The Ashes. The success of iPlayer may be down to a "long tail" effect, with users seeking out niche programmes; programmes broadcast on digital channels are doing remarkably well. However, this is expected to change with the introduction of booking programmes to download in advance, and automatic downloading of the next episode. The demands of the iPlayer have met with some concern and criticism from UK ISPs due to the added bandwidth the service will need. Several ISPs, notably Tiscali, have called on the BBC to partially fund network upgrades to cope with iPlayer traffic. The BBC responded by saying that the iPlayer was driving demand for broadband subscriptions. By May 2010, the site was getting 123 million monthly play requests. The service was being used by 40 per cent of online adults in the UK by March 2012. During the 2005 and 2006 iPlayer trials, the digital rights management (DRM) system used was based on Microsoft's Windows Media DRM, which led to concerns about cross-platform availability, as this technology is available only for Windows XP. However, some users have managed to get it working using compatibility options in Microsoft's Windows Vista. The BBC emphasises that it "has a commitment to platform neutrality and a remit to make its content as widely available as possible", and that while the initial trial used a Microsoft-based technology, they are constantly looking for new technologies which would enable them to relax the restriction: Ashley Highfield, then BBC's director of Future Media and Technology, explained that "we have always started with the platform that reaches the most number of people and then rolled it out from there". They also point out that not all of the content delivered through the iPlayer will be subject to DRM – live streaming content, for instance, may not need the same level of control, presumably implying that players for OS X and Linux systems could be developed with a restricted range of content. However, a project was started to enable the iPlayer to work with other platforms via the Wine project. Streaming via the BBC iPlayer website is now available in all browsers supporting Adobe Flash. Also, iPlayer Desktop, which allows downloading programmes for later offline viewing, is available for Windows, Mac OS X and Linux. On 14 August 2007, the Free Software Foundation staged a demonstration outside BBC Television Centre. The FSF's Peter T. Brown criticised the BBC for what he claimed was a break from previous tradition: the insistence that, for the first time, BBC viewers would be forced to use proprietary technology to watch BBC programmes. On 18 February 2010, the BBC updated iPlayer with an SWF verification layer which attempts to close the door on open source implementations of Real Time Messaging Protocol streaming. The attempt was unsuccessful, with most existing open source applications remaining capable of playing or downloading RTMP content from the iPlayer. BBC TV productions are paid for by the UK television licence fee and rights agreements with third parties. Thus, all BBC iPlayer TV programmes are accessible from IP addresses allocated to the UK only, as of 2011[update]. However, most radio programmes can be accessed globally, with the exception of a few programmes, mainly sports broadcasts, that are affected by rights issues. 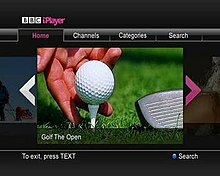 An international version of the iPlayer was launched on 28 July 2011 in eleven western European countries, after receiving the approval of the BBC Trust in November 2010. The international iPlayer takes the form of an iPad application which offers a limited amount of free content, supported by pre-roll ads and sponsorship, but its core business model is subscription (subscription costs approximately £5.00 per month). The global iPlayer app includes some features that are not in the UK version, including the ability to stream shows over 3G as well as Wi-Fi, and a downloading feature to store programmes on one's mobile device for offline viewing. At launch 1,500 hours of content was made available, of which 60% had been produced and commissioned by the BBC, while 30% had been commissioned by the BBC but produced by independents. The other 10% was entirely non-BBC content, including ITV's Primeval, and Channel 4's The Naked Chef and Misfits. Launches in Australia and Canada followed by the end of 2011 as part of what was intended to be a one-year pilot. Although US availability was also anticipated in 2011, an American launch date was never announced. Reports from the summer of 2012 claimed that American cable providers threatened to drop BBC America if the iPlayer, which duplicates much of the content on the cable channel, were made available in the US market. In a statement on the difficulties facing the US rollout, BBC's Head of Communications for Global iPlayer Tessa Matchett said: "The United States is a very complex media market. Currently, we have one very successful cable channel in BBC America, and we’re looking into what options we have to roll out additional platforms in that country." In May 2015, it was announced that the global iPlayer service would be discontinued. In early 2016, BBC Worldwide launched a version of the iPlayer service in Singapore, rebranded as BBC Player. The service is only available to Starhub subscribers who have subscribed to the BBC channels package in Singapore. The service was extended into Malaysia in 2017, however the service can only be accessed by UniFi subscribers who have signed up for the Jumbo pack on Hypp.TV. Access for Streamyx subscribers with the same Hypp.TV package was added a few months later. In March 2017, BBC Worldwide, as part of a joint venture with ITV plc, and BBC America co-owner AMC Networks, launched a new U.S. subscription video-on-demand service known as BritBox. In 2009, the BBC's April Fools' joke was a press release announcing the availability of the iPlayer on a specialised toaster, supposedly for users to watch breakfast television. The volume control of the iPlayer goes up to 11, apparently a nod to a scene about an amplifier volume control that goes up to eleven in the rock mockumentary This Is Spinal Tap (1984). ^ Hewines, James (2 December 2008). "BBC iPlayer Goes Local". BBC Internet Blog. British Broadcasting Corp.
^ "BBC iPlayer Help – Why must I sign in to a BBC account to use BBC iPlayer?". BBC iPlayer. Retrieved 31 May 2017. ^ "BBC iPlayer moves away from Flash and towards HTML5 – BBC News". Retrieved 24 July 2016. ^ a b "BBC Sounds branding replaces iPlayer Radio – RadioToday". RadioToday UK. Archived from the original on 18 October 2018. Retrieved 18 October 2018. ^ Bird, Tom (28 May 2009). "BBC Redux" (PDF). Sheffield: UKNOF 13: 2–16. ^ a b "BBC iPlayer Launched". Broadband Finder. 27 December 2007. ^ "BBC iPlayer Gets Re-designed be". BBC Press Office. 25 June 2008. ^ "BBC iPlayer Gets a Social Makeover". Tvgenius.net. 28 May 2010. Archived from the original on 18 July 2011. Retrieved 15 May 2011. ^ Clark, Paul (17 February 2011). "BBC – BBC Internet Blog: BBC iPlayer: find programmes from other on demand services". BBC Online. Retrieved 11 March 2012. ^ Watt, Dan Taylor (5 October 2014). "Rolling out 30 Day programme availability on BBC iPlayer". BBC Online. Retrieved 6 October 2014. ^ Laughlin, Andrew (19 February 2011). "Interview: BBC iPlayer boss Daniel Danker". Digital Spy. Retrieved 19 January 2012. [...] It was just about where we would have the biggest impact and it was judged that was iPad and Android. ^ Bobbie Johnson (14 May 2007). "Situation critical". The Guardian. London. ^ "BBC launches catch-up TV trials". BBC News. 29 September 2005. Retrieved 14 May 2008. ^ Goliath.com "Results of the BBC's Integrated Media Player trial" Check |url= value (help). Goliath. 13 April 2007. Retrieved 14 May 2008. ^ "BBC interactive Media Player: news & review". DJ Alchemi. 23 August 2004. ^ "RFI20080274 – draft response.doc". Whatdotheyknow.com. 27 July 2007. Retrieved 15 May 2011. ^ "BBC online video service launches". BBC News. 27 July 2007. Retrieved 1 January 2010. ^ Chris Williams (31 July 2007). "The BBC iPlayer 'launch' that wasn't". The Register. Retrieved 23 August 2008. ^ "Over 10,000 sign BBC iPlayer petition". ZDNet. 24 July 2007. Retrieved 25 October 2008. ^ "Government backs Trust on iPlayer". BBC. 7 September 2007. Retrieved 25 October 2008. ^ "iplayer – epetition response". 10 Downing Street. 6 September 2007. Archived from the original on 27 December 2007. Retrieved 14 January 2008. ^ "BBC enters strategic relationship with Adobe to enhance BBC iPlayer and bbc.co.uk". BBC Press Office. 16 October 2007. Retrieved 15 December 2007. ^ a b "BBC increases reach of iPlayer as streaming begins". BBC Press Office. 13 December 2007. Archived from the original on 16 December 2007. Retrieved 15 December 2007. ^ "Beeb iPlayer gets Firefox-friendly". The Register. 2 February 2008. ^ Conlan, Tara (14 June 2007). "Broadcasters in web TV talks". The Guardian. London. Retrieved 26 April 2010. ^ "Samuel L Jackson to promote cable iPlayer". DigitalSpy. 29 February 2008. Archived from the original on 5 March 2008. Retrieved 29 February 2008. ^ a b "BBC iPlayer On Virgin Media". BBC Press Office. 30 April 2008. Archived from the original on 6 May 2008. Retrieved 30 April 2008. ^ "iPlayer (A Freedom of Information request to British Broadcasting Corporation by Rose)". BBC Future Media and Technology via MySociety – WhatDoTheyKnow?. 8 April 2008. Archived from the original on 3 May 2008. Retrieved 19 May 2008. ^ "BBC to offer "series stacking"". British Broadcasting Corporation. 23 August 2008. Archived from the original on 17 September 2008. Retrieved 17 September 2008. ^ "BBC iPlayer: series stacking". British Broadcasting Corporation. 17 September 2008. Archived from the original on 21 September 2008. Retrieved 17 September 2008. ^ "Press Office – BBC unveils BBC iPlayer Desktop on Adobe AIR". BBC. 19 December 2008. Archived from the original on 4 June 2011. Retrieved 15 May 2011. ^ "BBC iPlayer now available on Mac". BBC News. 18 December 2008. Retrieved 26 April 2010. ^ Hattersley, Mark. "BBC releases iPlayer for Mac and Linux | iPod & Entertainment". Macworld. Archived from the original on 10 June 2011. Retrieved 15 May 2011. ^ a b Anthony Rose. "Internet Blog: Introducing BBC iPlayer Desktop for Mac, Linux and PC". BBC. Archived from the original on 4 June 2011. Retrieved 15 May 2011. ^ "Gamescom LiveBlog". Sony Computer Entertainment Europe. ^ a b c "BBC iPlayer goes global with iPad app launch in 11 countries". The Guardian. 28 July 2011. Archived from the original on 30 July 2011. Retrieved 28 July 2011. ^ a b Bradshaw, Tim (6 March 2012). "BBC expects Olympics to usher in new TV age". Financial Times. Retrieved 27 March 2012. ^ "BBC launches iPlayer Radio". BBC Media Centre. 8 October 2012. Archived from the original on 18 October 2018. Retrieved 18 October 2018. ^ "Why can I no longer download programmes to BBC iPlayer Desktop?". BBC. Retrieved 28 September 2013. ^ "Why are Windows Media downloads no longer available?". BBC. Retrieved 28 September 2013. ^ "get_iplayer search and PVR functions no longer work – no fix available". ^ "Unofficial BBC iPlayer RSS Feeds". ^ "Open BBC will display 'excellence without arrogance', says Tony Hall". The Guardian. Retrieved 9 September 2015. ^ "BBC to open up iPlayer to third parties, double down on high-quality dramas". Ars Technica. Retrieved 9 September 2015. ^ "BBC iPlayer (V2) closing on some older TV devices – Sept 2016". BBC iPlayer Help. Archived from the original on 11 April 2016. Retrieved 12 April 2016. ^ "BBC Sounds officially launched at London event – RadioToday". RadioToday. Archived from the original on 1 November 2018. Retrieved 1 November 2018. ^ "iPlayer 'loophole' to close on 1 September". BBC News. Retrieved 19 May 2017. ^ "iPlayer viewers must have TV licence but BBC can't track online cheats [Updated]". Ars Technica UK. Retrieved 23 May 2017. ^ "BBC iPlayer login will be required from 2017". BBC News. Retrieved 19 May 2017. ^ "How to sign in to BBC iPlayer". Retrieved 28 October 2017. ^ "BBC 'personalisation' app ties together iPlayer and other digital services". The Guardian. Retrieved 12 May 2017. ^ "iPlayer catchup service will require user login within weeks, says BBC". The Guardian. Retrieved 12 May 2017. ^ "Anglophiles: Hang up your VPN; iPlayer isn't for you anymore". Ars Technica. Retrieved 12 May 2017. ^ Ian Morris (31 July 2007). "Crave Talk: Five things that are wrong with BBC iPlayer". CNET. ^ Simon Fluendy (16 March 2008). "BBC iPlayer fans face hidden costs". Evening Standard. London. ^ "Beeb's iPlayer reaps streaming traffic dividends". The Register. Archived from the original on 2 February 2008. Retrieved 27 January 2008. ^ Sweney, Mark (18 December 2007). "BBC gives the iPlayer a festive push". The Guardian. London. Retrieved 26 April 2010. ^ "What kind of programmes are available on BBC iPlayer?". BBC. Retrieved 27 January 2008. ^ a b Anthony Rose (25 June 2008). "BBC iPlayer 2.0: Sneak Preview". BBC. Retrieved 25 June 2008. ^ Erik Huggers (26 June 2008). "BBC iPlayer 2.0: Promotional Video". BBC. Retrieved 26 June 2008. ^ a b "BBC iPlayer for children launches". BBC. 19 December 2008. Retrieved 6 April 2014. ^ a b "BBC iPlayer Desktop Manager release notes". BBC. 1 April 2010. Retrieved 1 April 2010. ^ "BBC unveils iPlayer 3.0 with chat, social networking functionality". Archived from the original on 13 September 2011. Retrieved 11 March 2012. ^ "BBC iPlayer Desktop – Why am I unable to install new content and why have I lost downloaded content since installing the latest version of Adobe Air?". BBC. 9 November 2012. Retrieved 13 November 2012. ^ "BBC iPlayer Desktop – Why am I unable to download programmes when using Google Chrome?". BBC. 5 December 2012. Retrieved 15 March 2013. ^ "Ultra HD trial content in BBC iPlayer". BBC. Retrieved 15 September 2015. ^ "BBC - BBC iPlayer to stream Planet Earth II footage in Ultra HD and HLG - Media Centre". www.bbc.co.uk. ^ Sulleyman, Aatif (12 February 2016). "BBC iPlayer Tips and Tricks: How to Stream BBC Shows". Gizmodo UK. Retrieved 4 June 2016. ^ BT (26 May 2008). "TV Replay Is Changing". BT. Archived from the original on 25 October 2008. Retrieved 26 May 2008. ^ "BT Vision charges for BBC content". BBC News. 6 June 2008. ^ "BT Vision VOD package review". Tech Radar. 26 September 2009. ^ "BBC and BT partner to bring BBC iPlayer to BT Vision". BBC. 11 November 2010. ^ "BBC iPlayer on TV in your living room: update". BBC. 5 April 2011. ^ "BBC iPlayer launches on BT Vision". Digital Spy. 22 June 2011. ^ "Where to get BBC iPlayer Home Media Hubs". bbc.com. Archived from the original on 29 July 2011. Retrieved 24 August 2011. ^ "BBC Trust rejects IP Vision iPlayer complaints". Broadband TV News. 22 December 2009. ^ "Freesat: 'No date yet on BBC iPlayer beta'". Digital Spy. 28 August 2009. ^ "BBC iPlayer Standard Products on TV Platforms". BBC. 2 November 2009. ^ "BBC iPlayer and ITV Player announce Freesat trials". BBC News. 25 November 2009. Archived from the original on 28 November 2009. Retrieved 1 January 2010. ^ "BBC iPlayer Available From Next Week". Join Freesat. 18 December 2009. ^ "BBC iPlayer Open To Public Beta". Join Freesat. 11 January 2010. ^ "BBC iPlayer Beta Testing On Sony". Join Freesat. 21 January 2010. ^ "BBC iPlayer To Launch On TechniSat, Harvard (pt2)". Join Freesat. 23 March 2010. ^ "BBC iPlayer comes to more Freesat boxes". Digital Spy. 1 April 2010. ^ "Panasonic Confirm BBC iPlayer Schedule". Join Freesat. 5 May 2010. ^ "Panasonic iPlayer Update For 2008 Televisions". Join Freesat. 28 September 2011. ^ "LG Offering Freesat Receivers For iPlayer". Join Freesat. 26 August 2010. ^ "Freesat Assign BBC iPlayer and ITV Player Channel Slots". Join Freesat. 16 December 2010. ^ Andrews, Amanda (4 May 2009). "Freeview rolls out high definition for World Cup". The Daily Telegraph. London. Archived from the original on 4 April 2010. Retrieved 26 April 2010. ^ Solomon, Kate (10 February 2012). "Roku hits UK – brings iPlayer, Netflix and HD streaming". TechRadar. Retrieved 1 August 2013. ^ "The NOW TV Box is here!". Now TV. 26 July 2013. Retrieved 1 August 2013. ^ "Sky Anytime+ goes from strength to strength with more content and increased reach". BSkyB Corporate. 30 January 2012. ^ "BBC iPlayer comes to Sky+". BBC. 30 October 2012. ^ "iPlayer deal saves BBC Sky platform costs". Broadband TV News. 12 March 2012. ^ Laughlin, Andrew (30 October 2012). "BBC iPlayer goes live on Sky+ catch-up TV service". digitalspy.co.uk. Retrieved 24 January 2013. ^ "iViewer iPlayer TV coming soon from... Marks & Spencer". Electricpig. 8 December 2009. ^ Warman, Matt (11 January 2010). "BBC iPlayer to be built in to Samsung TVs". The Daily Telegraph. London. Archived from the original on 1 May 2010. Retrieved 26 April 2010. ^ "Sony ditches AppliCast in favour of new net portal, plans BBC iPlayer for TV and Blu-ray". Home Cinema Choice. 11 March 2010. ^ "Sony brings BBC iPlayer to Bravia TVs". TechRadar. 15 September 2010. ^ "Virgin Media and BBC partner to bring BBC iPlayer to TV". BBC. 30 April 2008. Archived from the original on 7 May 2008. Retrieved 30 April 2008. ^ "BBC iPlayer content enters Virgin EPG". Digital Spy. 30 May 2008. Archived from the original on 31 May 2008. Retrieved 30 May 2008. ^ Dave West (21 July 2008). "Cable iPlayer earns 10.5m views". Digital Spy. Archived from the original on 1 September 2008. Retrieved 1 September 2008. ^ "Virgin 'accounts for third of iPlayer viewing' – Digital TV News". Digital Spy. 26 September 2008. Retrieved 15 May 2011. ^ "HD content comes to BBC iPlayer on Virgin Media". BBC. 1 May 2009. ^ "Ofcom: BBC syndication policy fails consumer". Broadband TV News. 2 March 2011. ^ "BBC syndication policy begins to bite". Broadband TV News. 7 April 2011. ^ "Humax YouView DTR-T1000 review". Expert Reviews. 24 July 2012. ^ Alexander, Jem (2 December 2008). "PS3 now fully supported by BBC iPlayer". Joystiq. Retrieved 15 May 2011. ^ "BBC iPlayer Statistics – January 2010". Slideshare.net. Retrieved 15 May 2011. ^ Clover, Julian (12 November 2010). "iPlayer requests at all time high". Broadband TV News. Retrieved 15 May 2011. ^ Anthony Rose. "Internet Blog: New version of BBC iPlayer for PS3 now available". BBC. Retrieved 15 May 2011. ^ Chacksfield, Marc (21 June 2010). "BBC: PS3 version of iPlayer 3 'this year' | News | TechRadar UK". Techradar.com. Retrieved 15 May 2011. ^ Halliday, Josh (8 August 2011). "New iPlayer app launches on PS3". The Guardian. Retrieved 8 August 2011. ^ "Sony Confirms Most PlayStation 4 Services Remain Free as Microsoft Continues Charging". International Business Times. Retrieved 28 October 2013. ^ "BBC announces Nintendo Wii deal". BBC News. 9 April 2008. Archived from the original on 10 April 2008. Retrieved 10 April 2008. ^ "BBC iPlayer on Wii". BBC News. 9 April 2008. Archived from the original on 13 April 2008. Retrieved 12 April 2008. ^ Sherwood, James (10 September 2009). "Wii web update wallops BBC iPlayer • reghardware". Reghardware.co.uk. Retrieved 15 May 2011. ^ "BBC iPlayer launches Wii channel". BBC News. 13 November 2009. Retrieved 26 April 2010. ^ Nintendo Life. "BBC is "Working to bring iPlayer" to the Wii U". Nintendo Life. ^ Peter Lasko. "BBC Blogs – Internet Blog – BBC iPlayer comes to the Xbox One". Internet Blog. ^ McFerran, Damien (28 May 2015). "BBC iPlayer Finally Arrives On The Wii U eShop". Nintendo Life. Retrieved 29 May 2015. ^ Whitehead, Thomas (30 September 2016). "BBC iPlayer App to End Service on Wii U in Early 2017". Nintendo Life. Retrieved 5 October 2016. ^ Barnett, Emma (28 November 2009). "Xbox 360 iPlayer launch delayed indefinitely". The Daily Telegraph. London. Retrieved 26 April 2010. ^ "Putting BBC content on the Xbox LIVE". British Broadcasting Corporation. 5 October 2011. ^ "BBC iPlayer launches on Xbox LIVE". British Broadcasting Corporation. 20 March 2012. ^ "Xbox One price, release date and official specs". What Hi-Fi?. 25 October 2013. Retrieved 28 October 2013. ^ "Is BBC iPlayer available on Xbox One?". BBC. Retrieved 16 December 2013. ^ Martin, Liam (20 January 2014). "Kinect blamed for BBC iPlayer delay on Xbox One". Digital Spy. Retrieved 24 March 2014. ^ Parnwell, Marcus (8 August 2014). "New BBC iPlayer for Connected TVs: update". BBC. Retrieved 30 September 2014. ^ Lasko, Peter (4 December 2014). "BBC iPlayer comes to the Xbox One". BBC. Retrieved 18 December 2014. ^ Madden, Dave (23 June 2010). "BBC iPlayer on mobile: a new version and Adobe Flash 10.1 streaming on all Android 2.2 phones". BBC Internet Blog. Archived from the original on 13 February 2011. Retrieved 11 February 2011. ^ "myPlayer taken out by the BBC – latest app update removes BBC content". Eurodroid. 20 November 2010. ^ Madden, Dave (12 July 2010). "BBC iPlayer on Android update". BBC Internet Blog. Archived from the original on 25 July 2010. Retrieved 25 July 2010. ^ Danker, Daniel (8 February 2011). "BBC iPlayer apps, coming soon to Android and iPad". BBC Internet Blog. Archived from the original on 11 February 2011. Retrieved 11 February 2011. ^ Madden, David. "Mobile Downloads for BBC iPlayer". BBC Internet Blog. Retrieved 23 January 2013. ^ Yanda, Chris. "New BBC Media Player for Android phones and tablets". BBC Internet Blog. Retrieved 20 September 2012. ^ "BBC iPlayer for BlackBerry breaks out". Pocket-lint. 5 November 2010. ^ "BBC iPlayer app streams video on the 3G mobile networks". BBC News. 12 December 2011. Retrieved 12 December 2011. ^ "BBC iPlayer launches mobile-download service". BBC News. 4 September 2012. Retrieved 4 September 2012. ^ Anthony Rose (7 March 2008). "BBC iPlayer On iPhone: Behind The Scenes". BBC. Archived from the original on 11 March 2008. Retrieved 10 March 2008. ^ "BBC iPlayer comes to the iPhone". BBC News. 7 March 2008. Archived from the original on 9 March 2008. Retrieved 10 March 2008. ^ "BBC calls DRM cops on iPlayer download party". The Register. Archived from the original on 14 June 2008. Retrieved 4 June 2008. ^ "BBC iPlayer fix hacked again!". Paul Battley. Archived from the original on 2 June 2008. Retrieved 6 June 2008. ^ Matthew Postgate (8 September 2008). "BBC iPlayer on Nokia N96 mobile phone". BBC Internet Blog. Archived from the original on 11 September 2008. Retrieved 8 September 2008. ^ "BBC iPlayer offered on Nokia N96". BBC News. 8 September 2008. Archived from the original on 9 September 2008. Retrieved 8 September 2008. ^ Phil Lewis (9 September 2008). "Nokia N95/N96 BBC iPlayer Downloads working on Linux with vlc". Linuxcentre. Retrieved 9 September 2008. ^ Jo Best (12 December 2008). "iPlayer Day: More devices, more broadcasters". Cnet. Archived from the original on 14 December 2008. Retrieved 12 December 2008. ^ BBC Internet blogs (12 October 2008). "BBC iPlayer: New Mobile Website in beta". BBC. Retrieved 12 October 2008. ^ "BBC Trust approves proposals for BBC Store". bbc.co.uk. 27 February 2014. Retrieved 10 June 2015. ^ Farber, Alex (1 May 2015). "BBC Store to undergo major trial". broadcastnow.co.uk. Retrieved 10 June 2015. ^ Mark Sweney (27 June 2006). "BBC aims for 1 m iPlayer users". The Guardian. London. ^ Ashley Highfield (13 January 2008). "iPlayer Launch: First Indications". BBC. ^ a b c Mark Sweney (15 January 2008). "BBC iPlayer bursts through user target". The Guardian. London. ^ Richard Wray (30 April 2008). "BBC iPlayer Launched on Virgin Media". London: The Guardian. Archived from the original on 30 May 2008. Retrieved 22 May 2008. ^ Anthony Rose (25 June 2008). "BBC Internet Blog". BBC. Retrieved 25 June 2008. ^ Ian Morris (9 December 2008). "BBC iPlayer may be offered to its commercial rivals". CNET UK. ^ "Television Craft Winners in 2008 – The BAFTA site". British Academy of Film and Television Arts. 12 May 2008. ^ Ashley Highfield (14 January 2008). "iPlayer Launch: First Indications". BBC. ^ a b c d e Arthur, Charles (30 November 2009). "BBC iPlayer use, in beautiful graphics". The Guardian. London. Archived from the original on 10 May 2010. Retrieved 26 April 2010. ^ "The BBC iPlayer's 2009 TV top 10". The Guardian. London. 23 December 2009. Archived from the original on 5 April 2010. Retrieved 26 April 2010. ^ "The BBC iPlayer's 2009 audio top 10". The Guardian. London. 23 December 2009. Retrieved 26 April 2010. ^ Jemima Kiss (13 August 2007). "ISPs fear iPlayer overload". London: The Guardian. Archived from the original on 15 May 2008. Retrieved 27 April 2008. ^ "BBC and ISPs clash over iPlayer". BBC News. 9 April 2008. Archived from the original on 13 April 2008. Retrieved 27 April 2008. ^ Hewines, James. "Behind the scenes of BBC iPlayer". BBC Internet Blog. BBC. Archived from the original on 31 May 2010. Retrieved 1 June 2010. ^ "Vista.. Long live XP". BBC. Retrieved 4 February 2008. ^ "iMP using Microsoft ... no chance of a Linux version then ?". BBC. Retrieved 4 February 2008. ^ "BBC iPlayer on Linux project Wiki". BBC iPlayer Wiki. Archived from the original on 2 February 2008. Retrieved 4 February 2008. ^ "Free software campaigners stonewalled at BBC". The Register. 14 July 2007. ^ "BBC iPlayer rejects open source plugins, takes Flash-only path". The Register. 24 February 2010. ^ "BBC aims to gain from global iPlayer". The Daily Telegraph. 7 November 2010. ^ "BBC iPlayer Global App Hits The Wall In USA". HDTVtest. 11 August 2012. ^ "BBC shuts down iPlayer service for subscribers outside the UK". Engadget. Retrieved 23 May 2017. ^ "BBC Player set to launch in 2016". BBC Media Centre. Retrieved 24 April 2016. ^ "BBC Worldwide launches BBC Player in Malaysia". BBC Media Centre. Retrieved 13 March 2017. ^ "BBC Worldwide, ITV SVOD Venture BritBox Launches With $6.99 Monthly Price". The Hollywood Reporter. Retrieved 23 May 2017. ^ "'Coronation Street' Episodes Now Available on BritBox a Day After U.K. Debut". The Hollywood Reporter. Retrieved 23 May 2017. ^ "BBC iPlayer now available on a toaster". BBC internet blog. Retrieved 14 September 2016. ^ "Why the BBC's iPlayer volume control go to 11 – rxdxt". Rxdxt.tumblr.com. Retrieved 4 October 2011.